I prepared this tour guide for my daughter when she visited Dorfprozelten about 10 years ago. Given the intervening time there’s bound to be some changes…for example there is a local history museum which I haven’t seen. On the other hand it was then only a couple of years since I’d visited so things were fresh in my mind. So here it is, bearing in mind I had the Kunkel/Happ family in my mind as a focus. 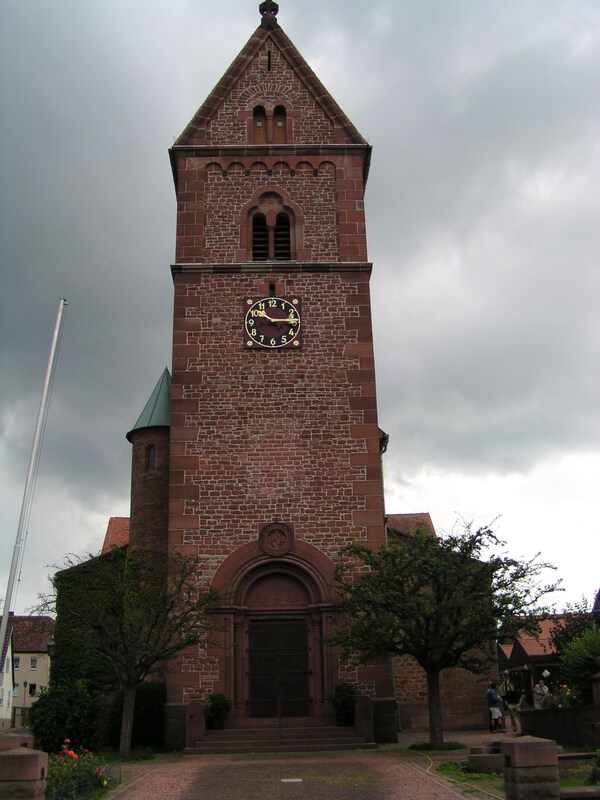 Start the tour at the church which is the most prominent feature of the town. This is not the original one but there are many features inside it which go back centuries. 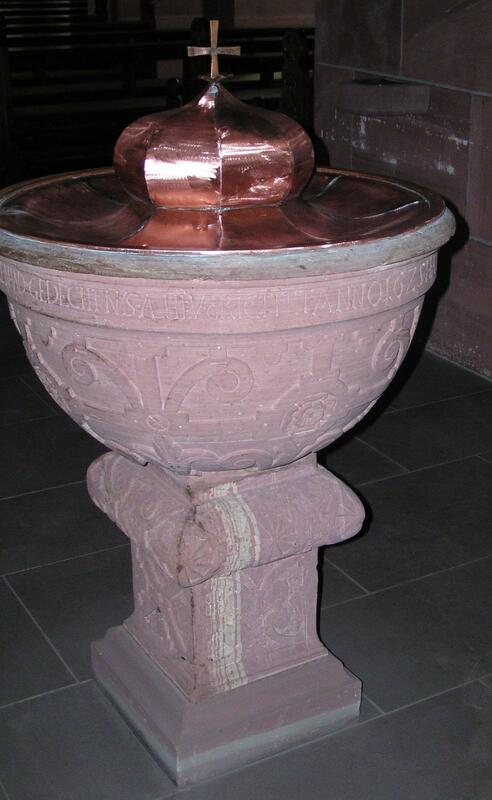 In particular look for the christening font which is a pink-stone font dating back to the 1600s. It has a bronze cover. 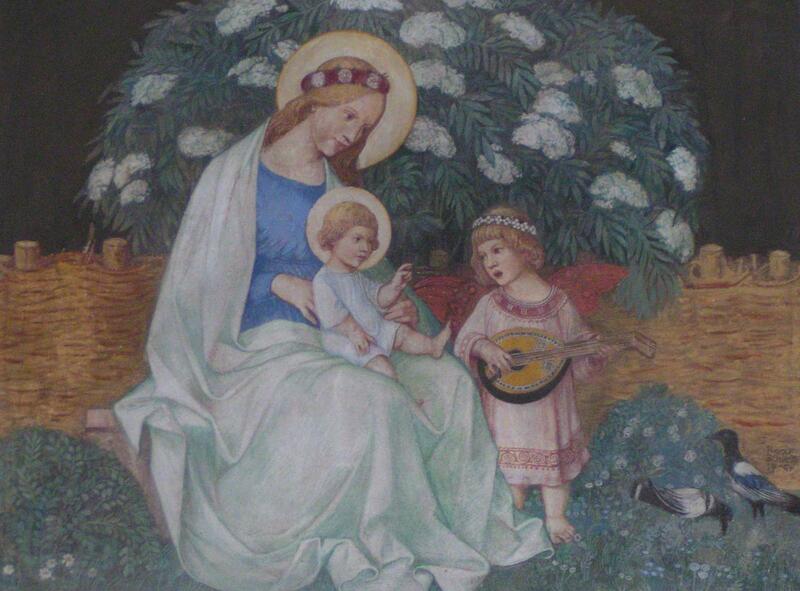 There are also some rather nice paintings in the church…I like the one of Mary and baby Jesus with a lute player and birds sitting under a tree with white flowers. The missal stand is also rather lovely. 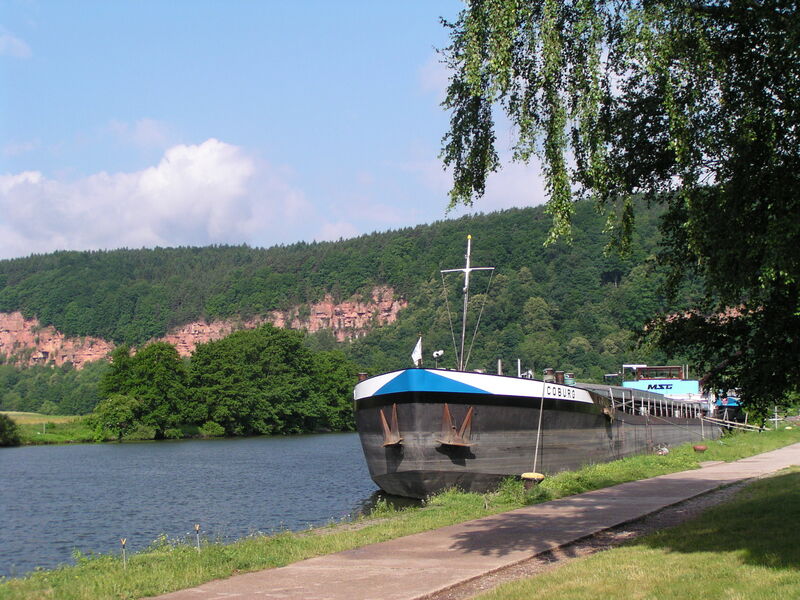 The pink stone is a feature of the town and is used in various things—it comes from the pink cliffs on the road out of town heading to Fechenbach and Miltenberg. It also caused the premature death of many stonemasons from the town. There is a lane up beside the church which leads up towards the hills and vineyards and which was the quick route to Mass! Once out of the church face the river with the church at your back. The old church and the school the Dorfprozelten emigrants would have attended were across the road to your left but immediately in front of you, pretty much, is an old barn that stood there long ago. 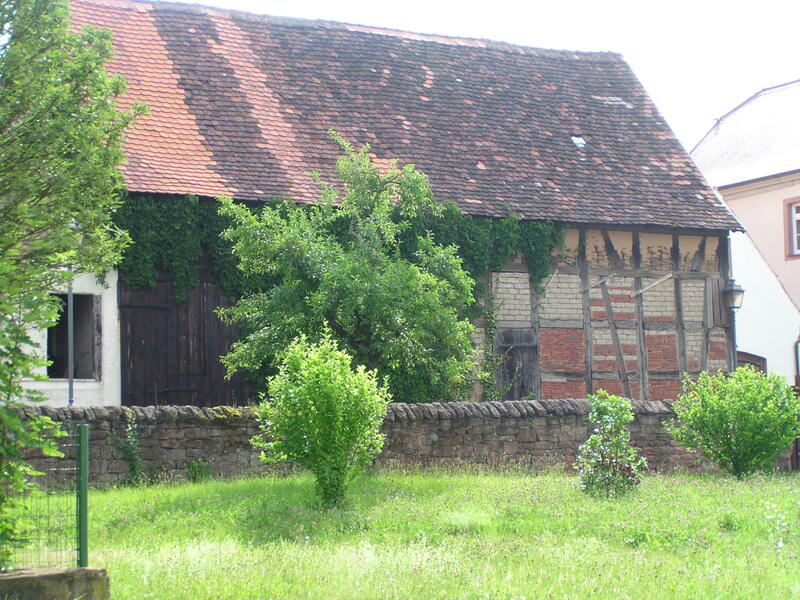 The timber framing which you see around the place (like the bones of the building on show and quite like old Elizabethan buildings in England) is called Faschwerk. 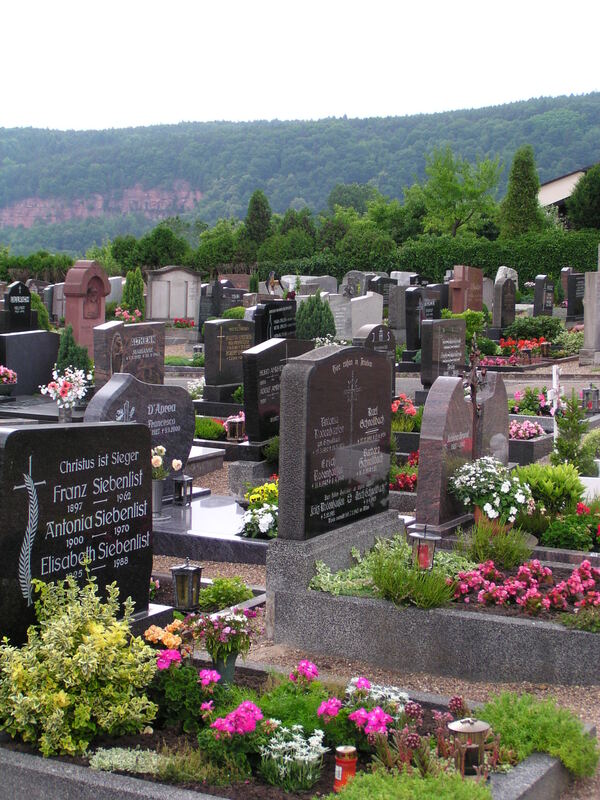 If you head to the left (this road to the left takes you to Stadtprozelten) along the main road this will take you to the cemetery –they “recyle” their graves so there are none specifically to see, but worth a short look to see how they tend them continuously and change the floral features for the season. 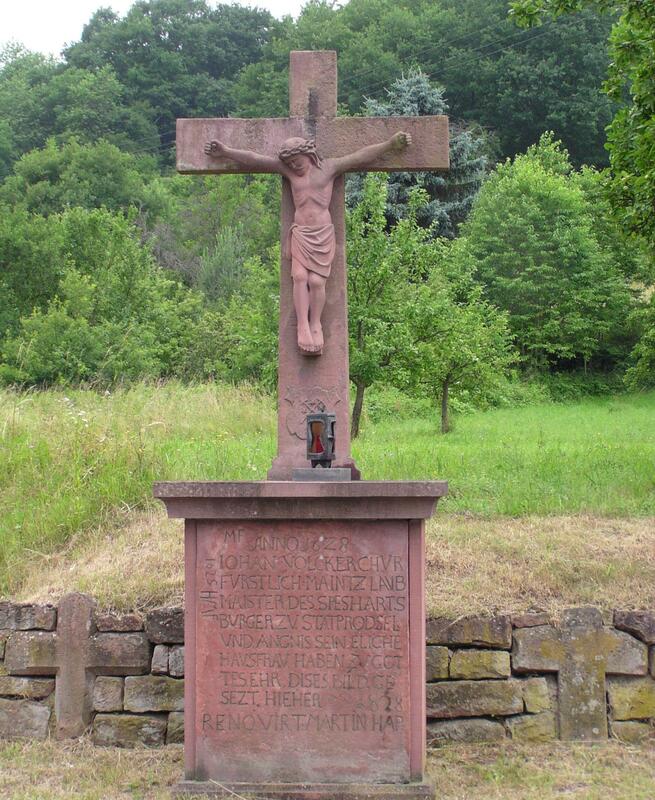 There is their equivalent of a War Memorial in the rear of the cemetery and there is also one in Stadtprozelten –interesting for an alternative perspective. Near the cemetery you will see the Fröhlichkeit Guesthouse which was owned by one of George Kunkel’s relatives. If you don’t feel like going as far as Stadtprozelten there is a turn off to the left near the Dorfprozelten town boundaries (I think) where there is a stone cross/crucifix which was erected in 1628 (in another location in earlier years/centuries) and renovated by my multiple great-grandfather (on the Happ side) in 1828. This shrine was built in 1628 and renovated in 1828. Along the way there is a butcher’s shop and bakery on the left hand side. If you want to return via a different way you can walk back along the river bank which has a cycle path along it. Situating yourself back at the church. 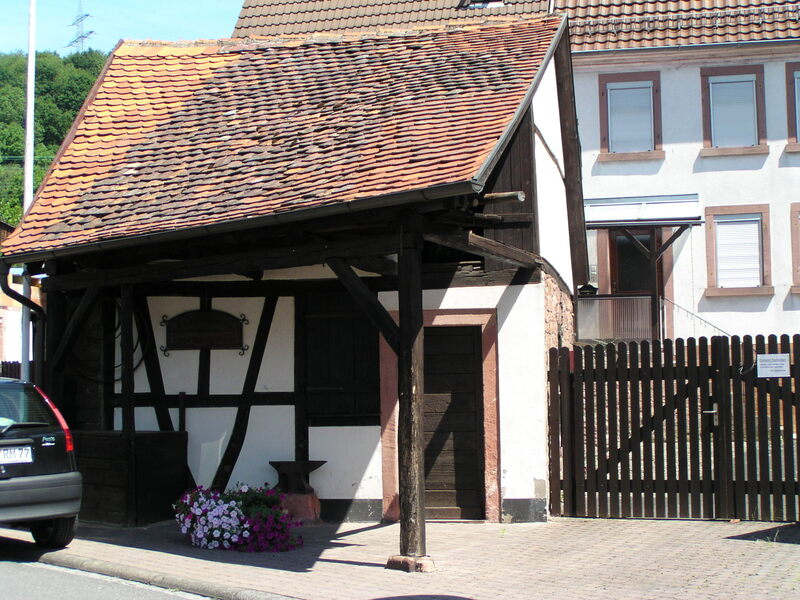 Cross the road and see the old inn called Gasthof zum Anker which has been in the town since George Kunkel’s time. Face the right and look down the street. 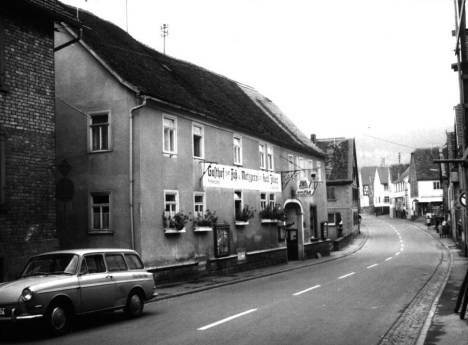 You will see a sign with “Bank” on it….this is the site of the Kunkel’s inn which was called “Das Goldenes Fass” or Golden Barrel. If you look down this street you will see many buildings which date back to the C19th and get a really good sense of how it was. In the distance you will see the pink stone cliffs (you will see these better from the river path). Same view but the inn has been replaced by the bank. After crossing the road from the church and walking a short way to the right, you will come to a street on your left. Take this and you will walk past the Town Hall (Rathaus) on your right of the street. On the left, shaded by trees, is another large crucifix. There is a lane running beside it which is worth a short wander down because you can see the old buildings and some sort of grinding stone. Returning to the street (not the lane) you will walk down it to get to the Gasthof zum Goldener Stern (Golden Star). 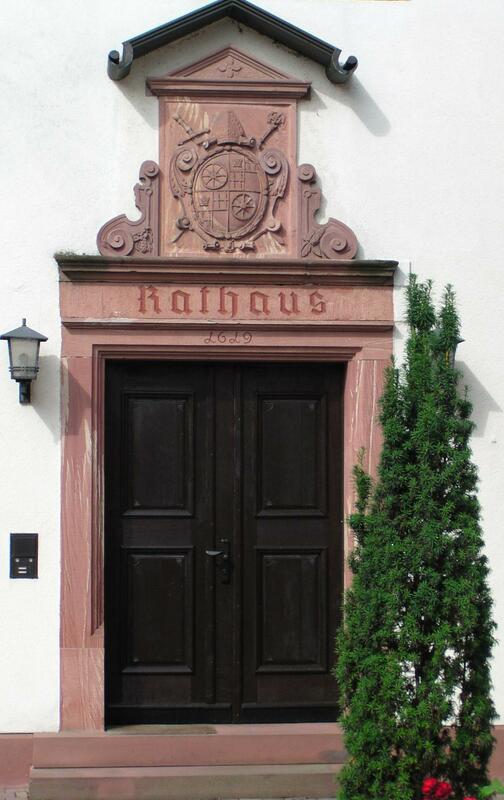 The lintels above a lot of the doorways have very old dates and in some cases you will see where the various floods have risen to (in Stadtprozelten and Miltenberg these are specifically marked and go back centuries). This Gasthof is essentially the sailor’s “union” site and there is a special table reserved for them in the inside dining room. They have a nice outside beer garden and you can eat there at lunch and dinner, a simple wurst or sausage is always nice. Try some of the local white wine –it is very apple-y. The old inn by the river. Also amusing on the right side of the road is the rather bizarre Ponderosa which seems to be a caravan park kind of thing though we’re rarely there when it’s in action (The Ponderosa was the name of the homestead in an old TV show called Bonanza so of course we usually hum the theme song!). Keep going down to the riverbank and you will almost certainly see one of the long barges anchored or going by. You can also look right & see the cliffs. The cliffs rise up from the River Main at the outskirts of town. There is usually a funny wooden boat there which looks rather like something by da Vinci. There are often flags on a flag pole near a shrine just back from the river. This is part of the sailors’ affiliations. 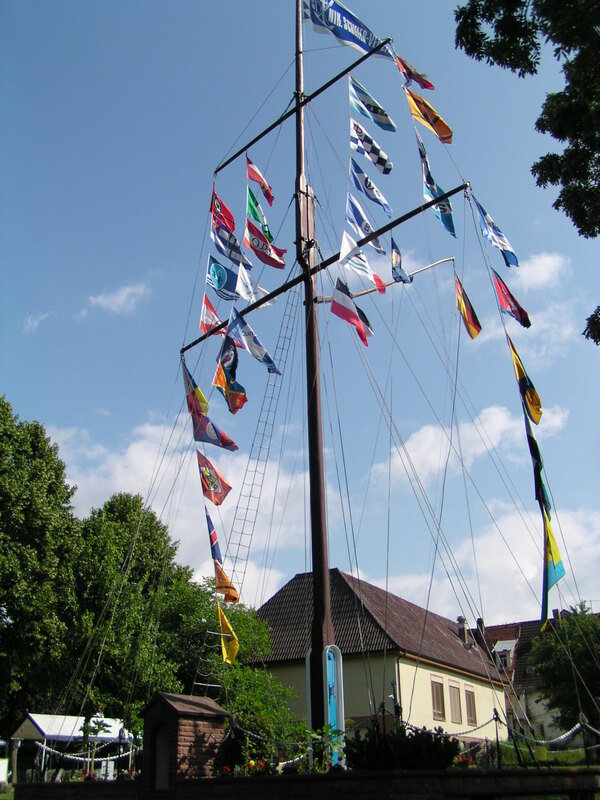 The sailors used to fly their flags to signify they were at home from the river. (I believe that in New England they used to put a half-pineapple on the door for the same purpose hence the significance of pineapples in the New England décor). So that’s the little side-street. Go back up the hill to its intersection with the main street and head towards the cliffs (ie turn left if you’ve come up the hill). 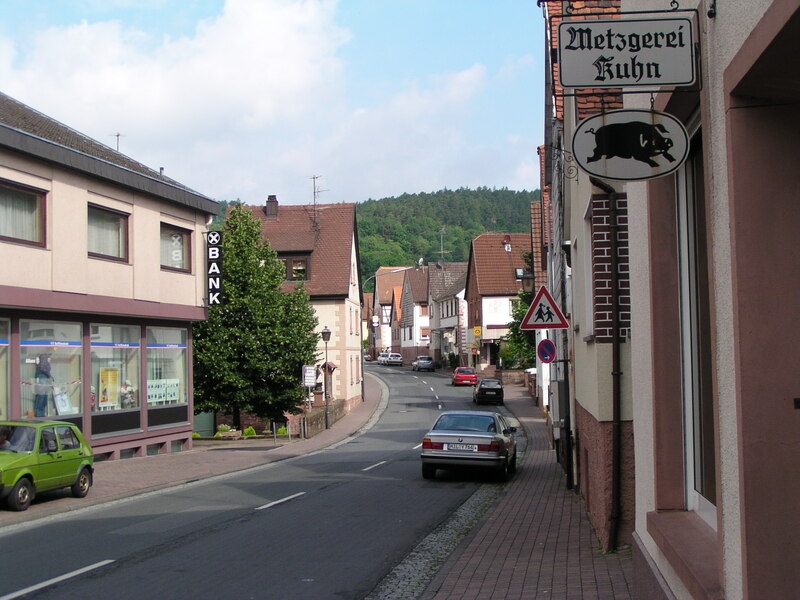 This takes you down the main street (Hauptstrasse) and you will soon pass the sacred site of our family’s inn now taken over by the bank. Their inn was one of the earliest recorded inns in the town. A postcard of the Happ/Kunkel inn called Das Goldene Fass. Compare it to the photo above taken from near the same spot. Just past this you will go over a sort-of small bridge, mainly noticeable by the stone “railings”. Beside it there is a statue which you should note –it is called the holy Nepomuk (die heilige Nepomuk -1616) and has also survived for some 400 years being “recently” renovated in the 1800s. It has also migrated from one side of the bridge to the other over the centuries!! There should be a map of the town near this bridge, in fact my photos show it beside the Nepomuk. Not too much farther on the right is another of the old inns, Das Goldene Krone (the Krebs inn). It has also been around since George Kunkel’s time. Many of these buildings are very old and pretty much as they were when the Dorfprozelten immigrants left in 1854-1862. Before this there is a newsagent and small shop which is probably closed on Sundays – you might want to see if they have a copy of Georg Veh’s book Dorfprozelten Teil II. You will reach an intersection of about four streets. On the right hand fork leading towards the hill you will see the old smithy. It is well signed and shouldn’t be hard to spot. 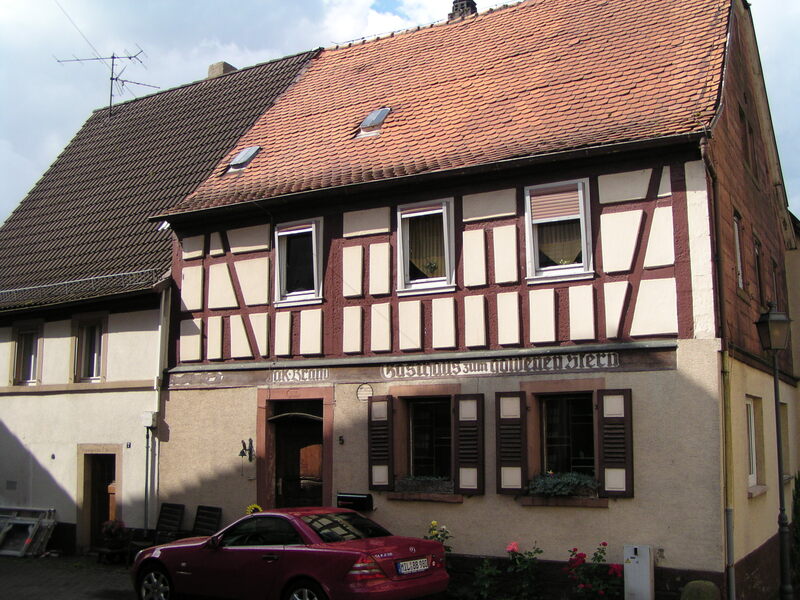 Across from that on the opposite corner (RHS going out of town) is a place that is now a pizzeria where one of the Dorfprozelten immigrants came from this house (Juliana Löhr married Andreas Diflo from Fechenbach and her cousin, Eleanor Löhr married Peter Faust in Australia). I have posted a photo of this on my Flickr site for the Diflo descendants. 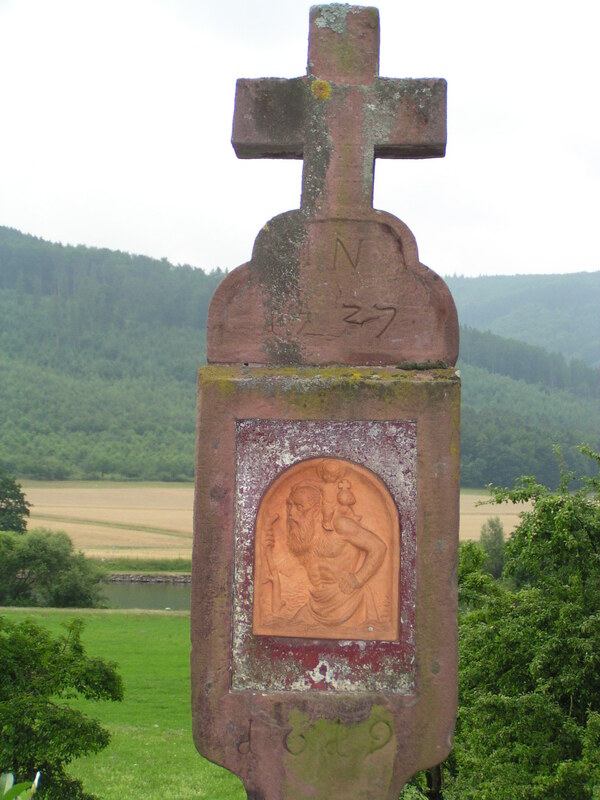 If you continue along the road out of town ie with the pizza place on your right, you will ultimately pass the small shrine which says “Gute Fahrt aus Dorfprozelten”, another very old memorial from 1629. On the right of the street, a little further along where the road veers, and somewhat recessed into the hill near the railway line is another Marian shrine which has an iron gate in front of it. There is a track up into the hills from here which leads to a forest or alternatively track up past the church to where you get an overview of the village. You can see the cliffs from here, and possibly the vineyards, as well as back along the river to the town. I think, though not 100% sure that there the street which leads up past the smithy goes up high enough to see over the village but all depends on time, weather & energy levels. If you get down along the bike path here you should get a good view of Dorfprozelten. 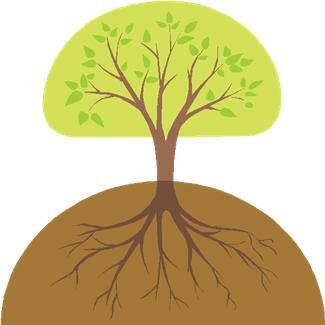 Image from Microsoft Office Clip Art. I’ve been asked by Paul Davis aka TravelingMan to publicise a reunion of the Zöller/Zeller family descended from Franz Ignaz Zöller and Catherine Beutel. Also descendants of Franz Joseph Xaver Zöller, brother of Ignaz, whose children Joseph, Caroline and Mary Rosalie, all came to Queensland, living in Chinchilla and Toowoomba/Drayton respectively. Paul is the contact for the reunion so please contact him directly on the email or mobile below. Alternatively you can leave a comment on this post. We are endeavoring to get access to a nearby Scout Hall in case of rain but the park has some tables wood bbq’s, shade and toilet facilities but would suggest you bringing fold up chairs and a picnic lunch as standard. I am endeavoring to set a computer and scanner and would be good if you could bring any photographs you may have with you. German Historical Gazetter: http://gov.genealogy.net/search. Within the boxes it gives an option to click on the wiki link and thence to the genealogy forum for the area. Do give it a try. Geonames search: http://geonames.nga.mil/ggmagaz/. This will give you the village’s coordinates and also map location. I’d like to acknowledge with thanks, that these links were brought to my attention by Saving Stories and Family Search. Welcome to my new blog about the Dorfprozelten immigrants to Australia. 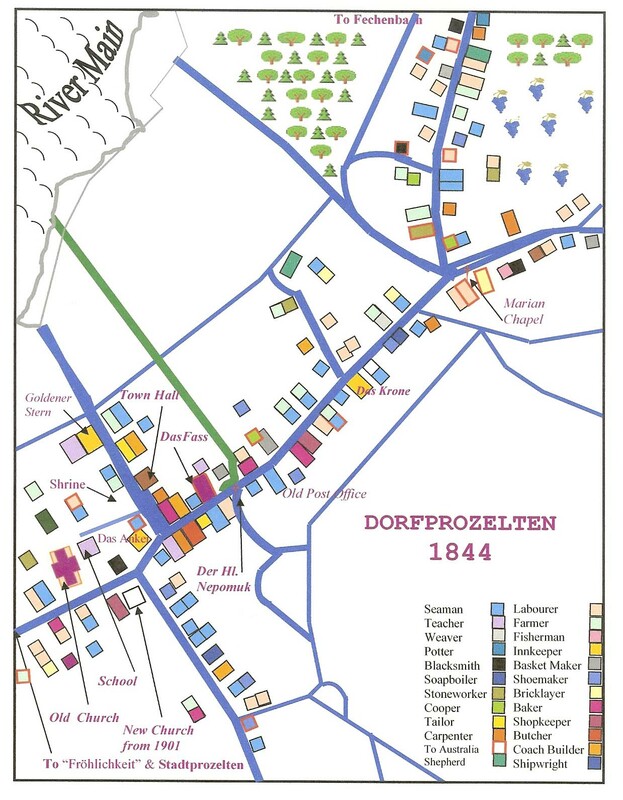 I know there are many emigrants from Dorfprozelten to north America as well and while the focus here is on Australia, if you have “Dorf” ancestry please do get in touch by leaving a comment etc. 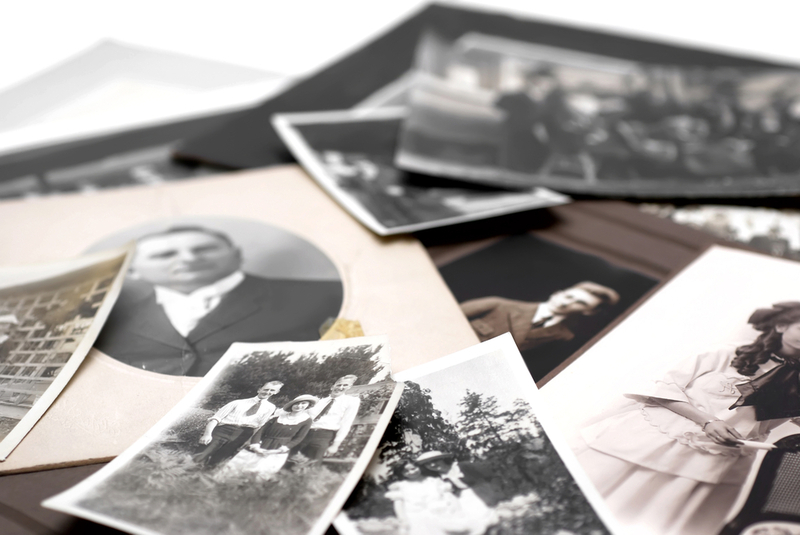 Perhaps you’d even like to write a story of your ancestors for the blog. 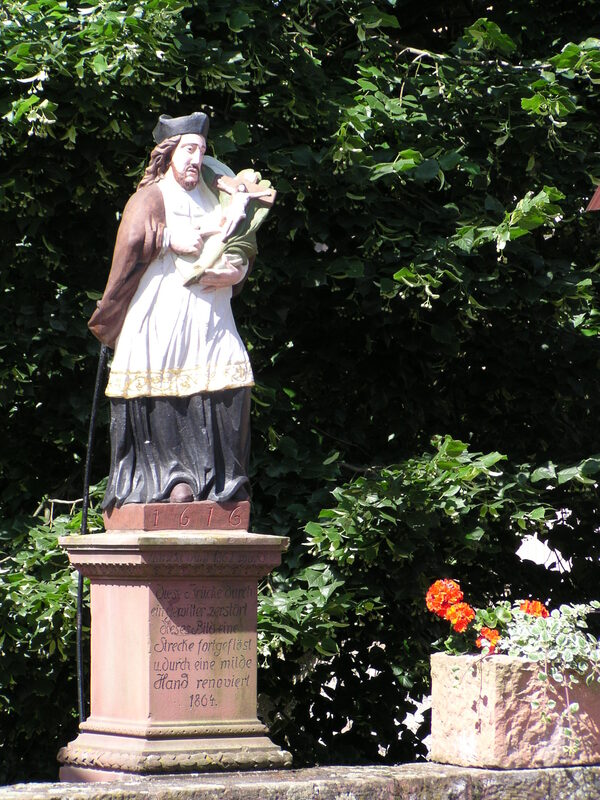 In Australia, German immigrants are traditionally associated with the Lutheran religion. This is not the case with those from Dorfprozelten where the primary religion is Roman Catholicism as it is across much of Bavaria. This is an important distinguishing characteristic among these migrants. 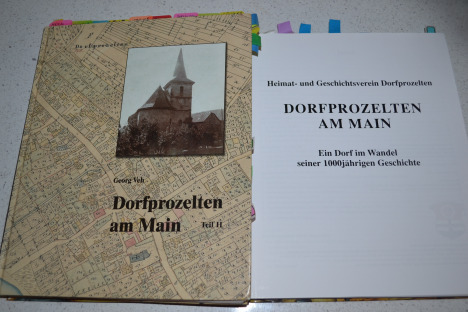 I started this separate blog as my Dorfprozelten page on Family History Across the Seas has been one of my most successful ones. It’s also provided links between family members which has made me pleased. It also means I get to learn more about the families <wink>. Please make sure you read the comments on that page to see if anyone has been in touch about your family. My plan in the first instance is to upload stories I’ve written for other reasons which may not be readily available to you. If these are your families, you may find that I’ve inadvertently made a mistake as you will know the detail of your family better than I do, especially as I haven’t been able to purchase many certificates for these emigrants. If you find a mistake please leave a message in the comments. Beneath the header images you will see a number of tabs which will tell you a bit more about me, about this blog and why I started this Dorfprozelten research. The reference tab also lists a number of very useful sources for anyone chasing ancestors from the village. Some are specific and some are more general but either way there’s much to be learned. What are the images that will shuffle as you change from page to page? Well they are ones I took during a 2003 visit to Dorfprozelten. Some don’t translate well to the panorama format, and some aren’t a great standard, but are probably still worth looking at for those with ancestry there. And if there’s some kind soul out there who has an urge to translate any of the stories into German, I’d be eternally grateful as my German skills are decidedly rusty and inadequate to the task.